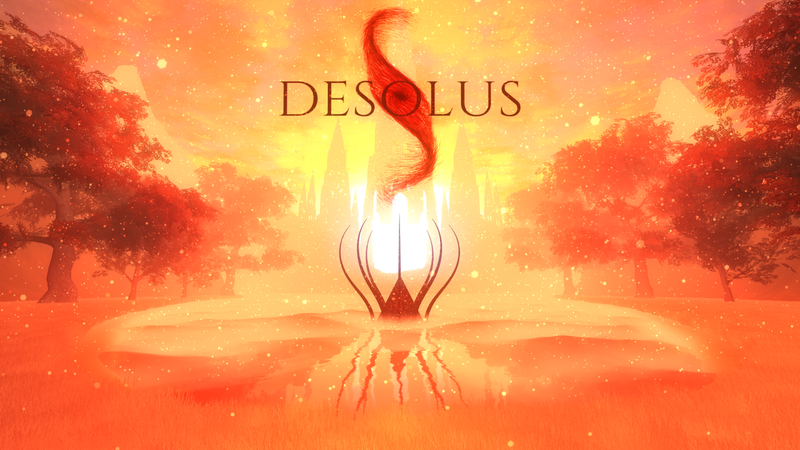 Desolus is an evolving project originating from several prototypes which began in September 2014. Production of the game's current iteration started in May 2017. 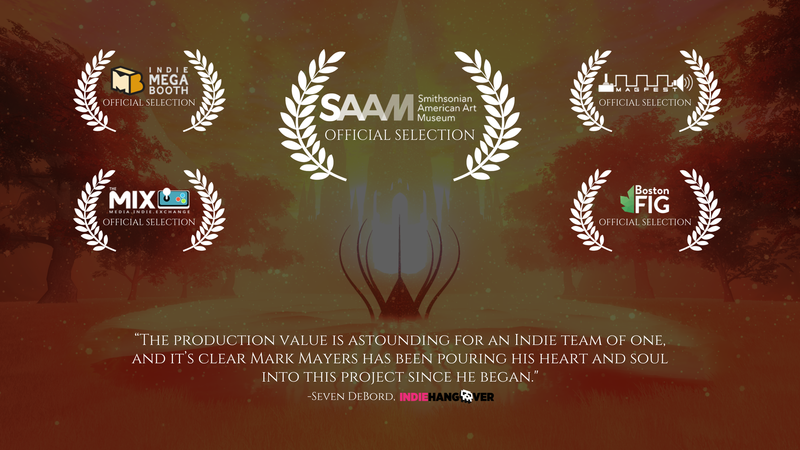 This development log documents the ongoing creation of Desolus by Mark Mayers. #5: Gravitational Lens Shader: Creating the black hole shader in Desolus, inspired by Interstellar. #19: Golden Ratio Level Design: Using golden ratio math to design levels. #26: Curvature of World Space: Using vertex shaders to make an 'Inception style' world. #37: Core Mechanic Iteration: Changing Desolus as a game through iterative design. #59: BFIG 2015: Presenting at the Boston Festival of Indie Games Digital Showcase. #76: PAX East 2016: Showing Desolus as part of the Indie Megabooth at PAX East. #80: Dimension Inversions: Expanding the core of the game with alternate dimensions. #88: Development Cycles: Insight into how Desolus is designed with iterative development. #91: Particle Culling System: Performance and optimization improvements with Frustum, Occlusion, and Dimension culling. #93: Zelda Based Dungeon Design: Looking at the Legend of Zelda for design inspiration. #95: 2016 Retrospective: Yearly retrospective on development from September 2014 to September 2016. #96: BFIG 2016: Presenting at the BFIG for the second time. #102: Dimension Inversions: Traveling between dimensions, and the inverted world. #110: Development Recap I-III: How several of the game's mechanics have evolved over time. #116: Architecture in Desolus: Revising the game by introducing architecture. #120: Inverted Architecture: A look at how architecture is geometrically inverted between dimensions. #123: 2017 Yearly Retrospective: Retrospective on development, and redefining Desolus as a game. #133: Terrain System Revamp: A technical look at increasing terrain fidelity and workflow. #142: 2018 Yearly Retrospective: What is Desolus and the game's current vision. #144: Rendering System Overhaul: Detailing the new rendering system and volumetric lighting in Desolus. You say you are by no means an artist, but then you show screenshots like that. I think it looks really nice! Any chance of some gameplay video to get a better idea of the mechanics? I wouldn't consider myself an artist mostly because I've never had any formal art training. I also took perhaps a completely opposite career path, haha. I'll definitely try to get a short video up illustrating mechanics soon, either tonight or tomorrow! Yeah, these are some pretty sick shots. Looks really interesting, and the game idea sounds interesting, as well. Action + Puzzle's always good. Keep it up! This started out as completely action (with the attract particles/bombard mechanic) but fairly recently I've been able to come up with interesting puzzle applications as well. I've found it very difficult to design around an 'experimental' mechanic, however. The game keeps evolving over time as I add/remove mechanics. This is my first update to the DevLog; I'm going to explain the mechanics a bit more with a few gifs. The gif below illustrates the concept of a Singularity Node. 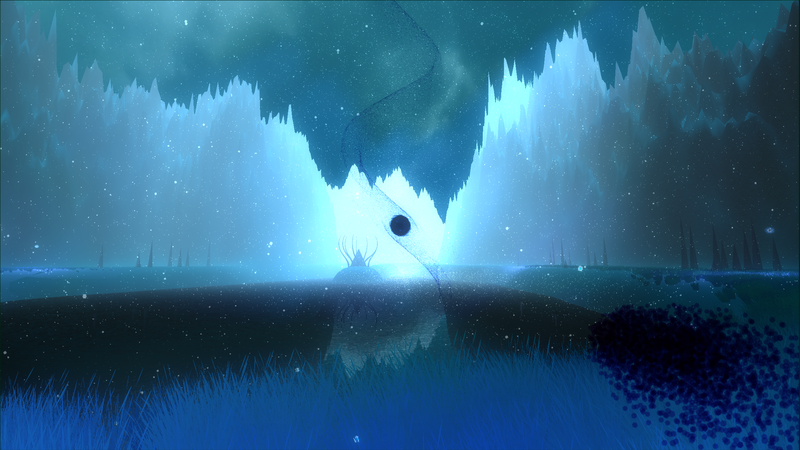 This is the first area of the playable game so far, where the player gets introduced to the singularity. Most of this intro is visual, but it describes to the player how singularity nodes work, and that singularities explode after a time. In the very beginning of the game, the player doesn't control the singularity. Most of the early puzzles are solved via these nodes. Later, the singularity can be independently placed. When introducing a mechanic, I show the player the cause/effect relationship of it first. This gif shows one of the most basic applications of the singularity, absorbing enemy projectiles for defensive purposes. This isn't really a puzzle, but it's the introduction to later puzzles that require more thought. In the beginning of this puzzle, the player has the choice of two paths. The left leads to the singularity node and eventual path, and the right leads to another turret that kills the player. It reinforces the concept that singularities explode... and you don't want to be near them when they do. I'll talk about Singularity Nullification and how that plays into the first few timing puzzles. That's pretty neat, cannot believe you do the assets AND the programming beside your daily job... impressive! The assets I make by hand are the particle effects and terrain. I use TC Particles, where I can set sprites/colors/forces/effects to produce unique looking environments and assets. The terrain I spend a decent portion of time sculpting and painting with textures. Structures relating to the Desolus itself are actually made using dynamic meshes via an algorithm. The 'pyramids' use a dynamic mesh where I can set the size/slope of the pyramid, and it creates vertices for the mesh appropriately. The 'arms' or tentacles are created using fractals with Unity primitives. I have a few different parameters such as size, curvature, and number of iterations that affect the shape. There are a few placeholder assets (such as the grass and trees) that I plan on replacing soon. However, those placeholders still represent the aesthetic I'm going for. Here's my second update for Desolus! I said in my last entry I would talk about Singularity Nullification. So this is a level where I introduce a few concepts to the player. The first, is the set of white spheres at the top right of the screen. These are an 'enemy' that shoots out projectiles that destroy the singularity, I call them, nullifiers. I force the player to walk over a few nodes that spawn the singularity. He/she can see the nullifiers shoot out a projectile that destroys it. This sets up context for the first type of puzzle of the game, which is based off of timing. The player must make it past the various turret enemies in the vicinity. The nullifiers must be at their farthest away point from the singularity, otherwise the singularity will explode too soon and the player will die. The elements for the player to consider are where the singularity spawns, the position of the nullifiers, and how to get past an area before the singularity explodes, either naturally, or via the nullification projectile. This is what the level looks like when prototyped. I make sure the levels are functional, and playtest them first before I add any art assets. This allows me to create and throw away/keep a variety of levels. Before this, I usually design the levels on paper! I am presenting this game on Thursday for NEXPO (Northeastern Entrepreneurship Expo). It's in Boston, on Northeastern University's campus from 6:30pm-9pm. Here's more info, it's free to register and attend! It would be great to talk to people in person, and you can play the demo! It's been a bit since my last update, it's been quite a busy two weeks! I've had a few significant milestones recently, however. I successfully completed the playable demo I was working on! Everything came together before Thanksgiving, and I was very happy about that. 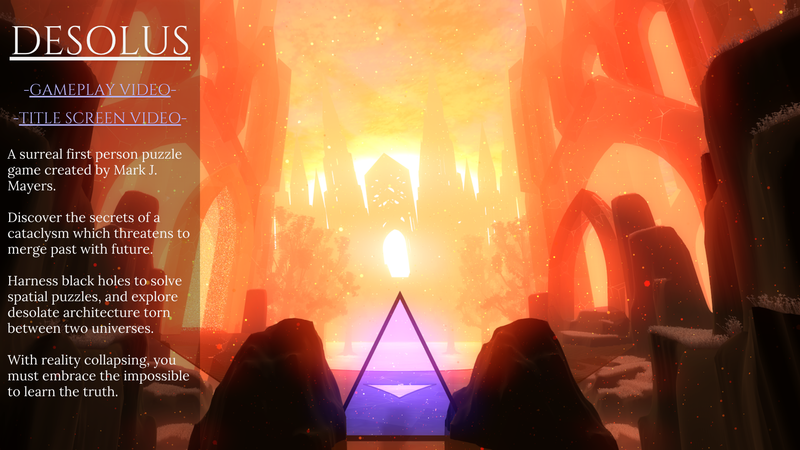 The demo contains about 8 levels, and took about 30 minutes during play testing. This was great because now I have an excellent core structure to expand on. For a while I didn't know where this game was going, but now I feel it has its own identity. I showed the game for the fist time in public! This was at NEXPO, (Northeastern Entrepreneurship Expo). About 400 people showed up over the course of 3 hours, I received very positive feedback regarding the visuals and learned a lot about how players understand mechanics. This was very different from the traditional 'Gaming Expo,' mainly because it wasn't one. I was the only video game there, the majority of individuals were presenting ideas for their startups. This was great, since I got a wide variety of people to play the game, some who traditionally don't play video games. There was one person who managed to complete the demo (it's apparently very difficult). He gave me a hug and wanted a picture with me; it's great to see when people enjoy your game. 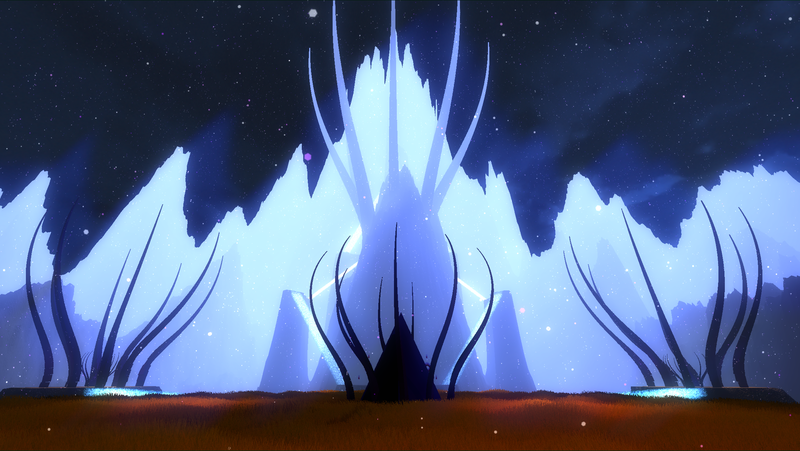 I submitted Desolus for PAX East 2015 for the MEGABOOTH! I'm incredibly excited about this, hopefully I am selected to participate. The MEGABOOTH is perhaps my favorite part of PAX East. It's the most organic, and feedback towards developers actually matters. I'm working on implementing Singularity Types, this one being fire. This is how the Singularity can be used offensively. I have the mechanics created, but applications not implemented yet. More on this later. College has been wrapping up for me; I essentially graduate tomorrow. 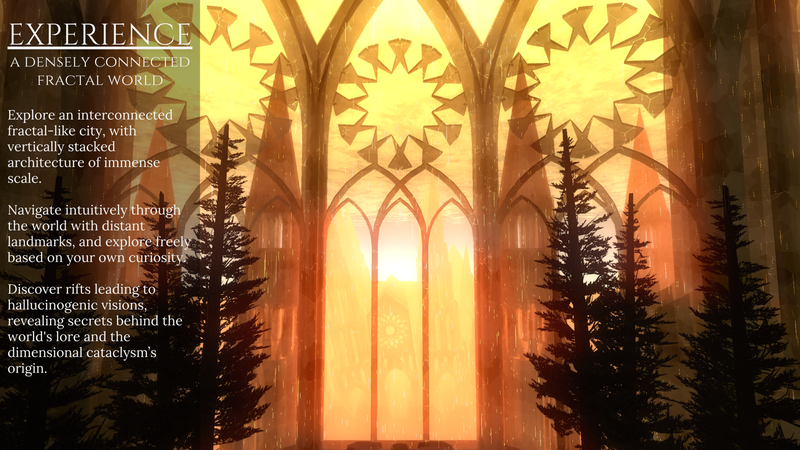 With finals over and a full time job secured, I can definitely put more time towards Desolus, which I'm excited for. This entry will be a bit short, but I wanted to talk about a new zone I made recently. 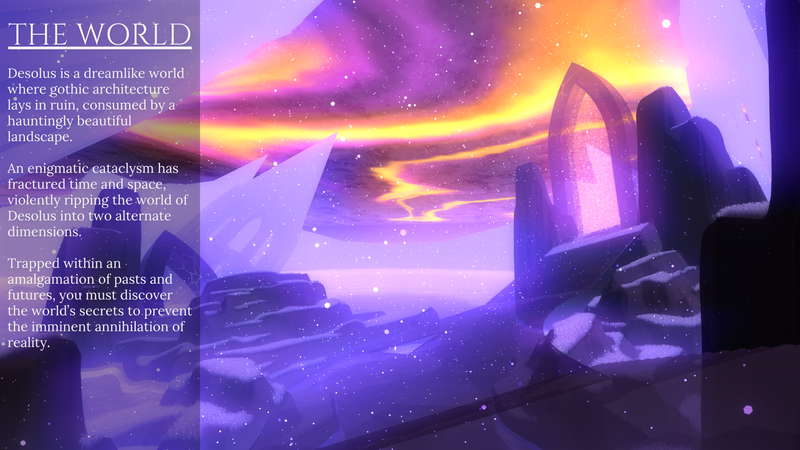 It's glacier themed and will focus on puzzles revolving around ice/cold mechanics. I'm incorporating elemental themes into puzzles. I mentioned briefly singularity types. The singularity/black hole has four elemental types, void, ice, fire, and electric. I'll probably post some gifs and explain more in the near future. It's been quite some time since I've updated this! It's been a busy month for me due to the holidays and moving to my new apartment. However, I have been working on Desolus throughout. Below is a gif showing how Singularity Bombardment works. 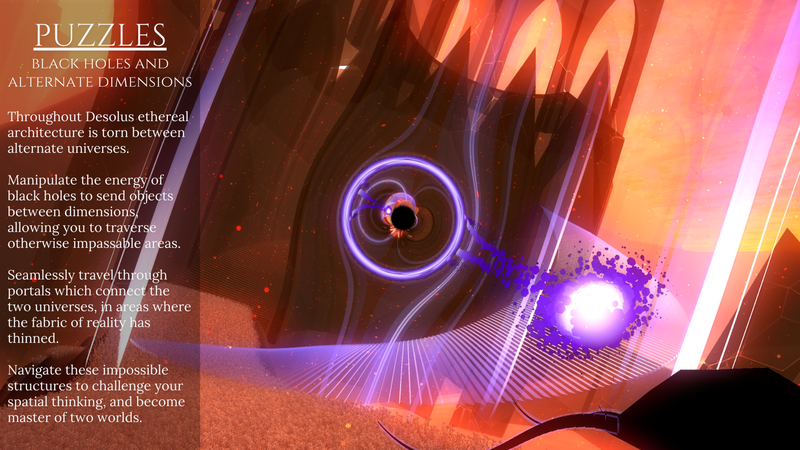 This is the core mechanic of the game; the Singularity can absorb projectiles and fire them back at enemies. The singularity also collapses when this happens (although I might tweak this later). The player doesn't have this ability at the beginning of the game, as this is a Metroidvania. 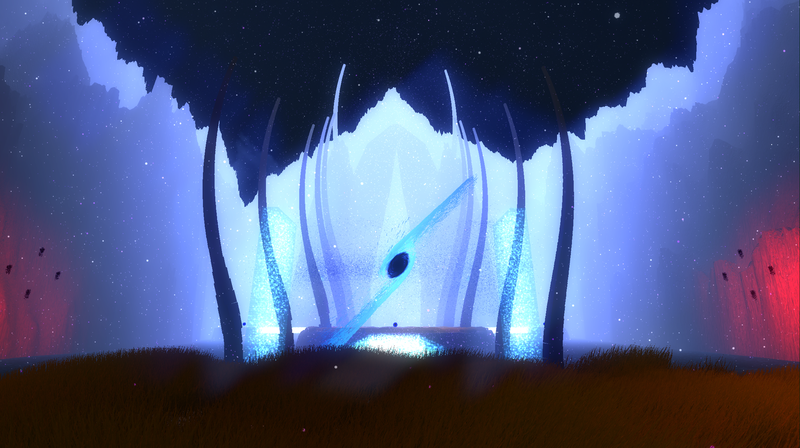 Note that the player can also control the singularity in this level. The player can use bombardment to destroy these turrets; this area is impossible to navigate through without doing this. Turrets also respawn after 8 seconds; the same timing a singularity has to explode. I can't start work for another 2 weeks, so I'm 'working' full time game development for now. Although I just posted a gif for the first time of the bombardment mechanic yesterday, it's been exactly as it has been since near the inception of the game. I decided to change it yesterday, based off of playtesting from a friend. Here's the new gif of how it works; same area as yesterday. I received feedback that there is no visual indication of when the singularity is 'ready' to shoot back. The mechanic was kind of ambiguous before. So I changed it to make a cool explosion sound, make the singularity glow red, and have a weapon appear in the player's hand. I also changed the gravity of the singularity slightly to be more interesting and realistic. It's pretty much Newton's Law of Universal Gravitation, except I 'cheat' a bit, by modifying the gravity constant at certain distances to be stronger. Before it was simply a direct modification of velocity, relative to the position of the singularity. Here's another gif in a test level to illustrate the concept of how it works. There can be multiple singularities, in which gravity has an interesting effect. More on that later. I'll be working pretty much all day today on the game. woah, really impressed by the graphics, you really got your way around with lighting and particles. 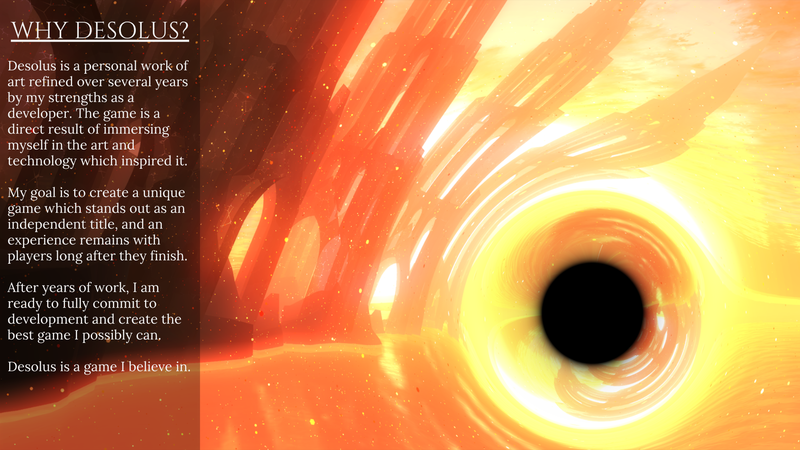 Yesterday I was experimenting with actually rendering the singularity/black hole beyond just particle effects. I saw Interstellar when it came out, and it's one of my favorite new movies. I read this article a while ago regarding rendering the black hole for the movie. I then raised the question, is it possible to do this in Unity? The answer is yes, here's a result of my experiments and research. The original shader I pulled from here. It gave a pretty comprehensive overview of how to render. Tweaking was a result of trial/error and critical thinking, but I somehow managed to get it close to where I want. I wrote a script that attaches to the main camera that makes the shader grow/shrink based off of distance and time. Getting the logic right for the singularity shooting/collapsing was slightly difficult, I learned all about how Unity renders things. I'm not sure if this will go in game *just* yet, as it's a bit disruptive to gameplay, and also buggy. Here's a blooper reel of my bugs when making this effect. Some of this was so strange I felt I needed to share. One of the first, and best, messups. This one looks like an eye!! Infinite recursion which flips the scene back/forth. Got a decent amount of work done today/yesterday; primarily fixing bugs and playtesting. The game is turning out to be 'Dark Souls hard' according to my friends... which is exactly what I wanted, heh. So far, I have somewhat completed the *initial* version of the Void Canyon, which is the first area of the game. This is a picture of the final level of this area, which tests all of the skills you've learned. I plan to have four total areas of the game, with the themes of Void, Ice, Electricity, and Fire, which fit into the singularity abilities/types you acquire. The next area I will be working on is the ice area, which I posted earlier. One mechanic I never mentioned was Light Bridges and Blue Nodes. This has been an existing feature for a long time, and is one of the core concepts of the first area. Below is a fairly difficult level of the game so far that tests this concept, after you have practice from earlier levels. When a singularity is near a blue node, it spawns a light bridge. There can be multiple singularities and nodes active at one time, meaning interesting puzzles can be made with them. After 8 seconds, the singularity explodes, and the light bridge disappears. This usually results in the player's death, as he/she falls into the water below. From here I will continue to refine the first 'act' of the game, and begin work on the second area. Did a ton of playtesting with friends in the past few days. One of my friends had some excellent suggestions, and I decided to take them to heart by completely redoing the first few levels. 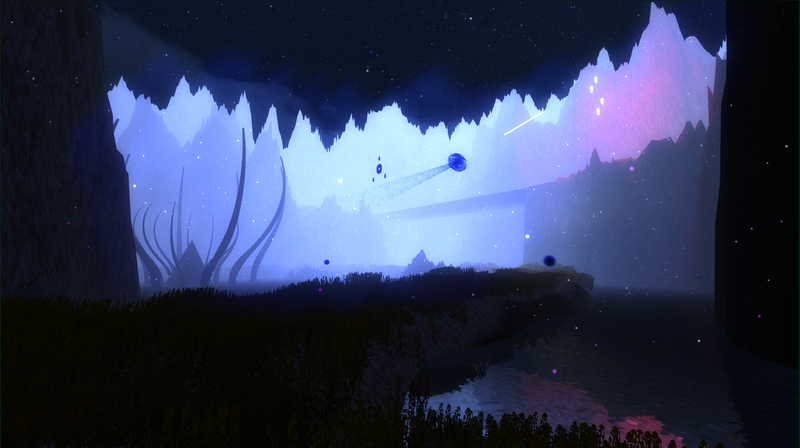 Below is the first area of the game, redone, introducing you to the Desolus and the singularity. The level still needs a bit of work, but I'm happy with it so far. I also polished the light bridges mechanic into Particle Walls which can destroy enemy projectiles. They still function as 'bridges' as well, and are activated via the blue nodes. The enemies to the left in this gif shoot out projectiles that destroy the singularity on collision. 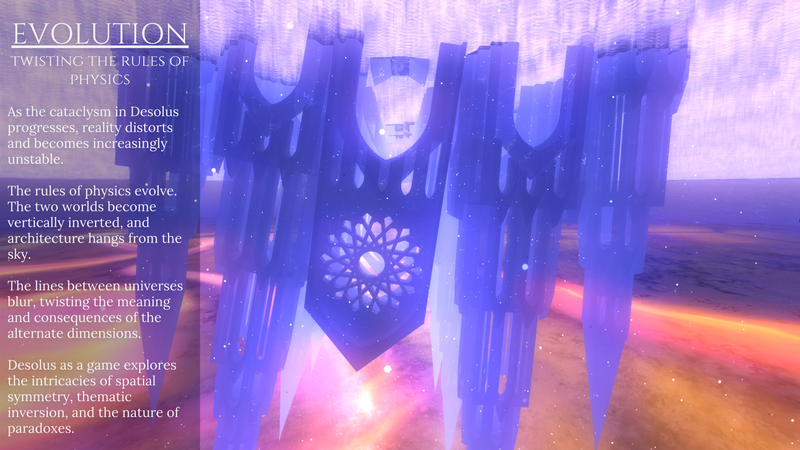 In order to survive this area, the player must activate this particle wall to block these projectiles. I'm probably going to redo the first 6 'prototype' levels and keep the last 6 'real' levels of Act 1. I think I would rather polish a bit more of what I have than create additional content, for now. As I said in an earlier post, I am completely redoing the first few levels of the game. I'm holding myself to perhaps unrealistically high quality standards, but oh well. This is the main 'hub' of the Void Canyon, the first zone. There are three paths, two of which can only be accessed after acquiring new abilities, hence the 'Metroidvania' aspect of the game. This picture is the first real puzzle of the game. The black enemies to the right/left destroy the singularity, as illustrated in a gif later in this post. 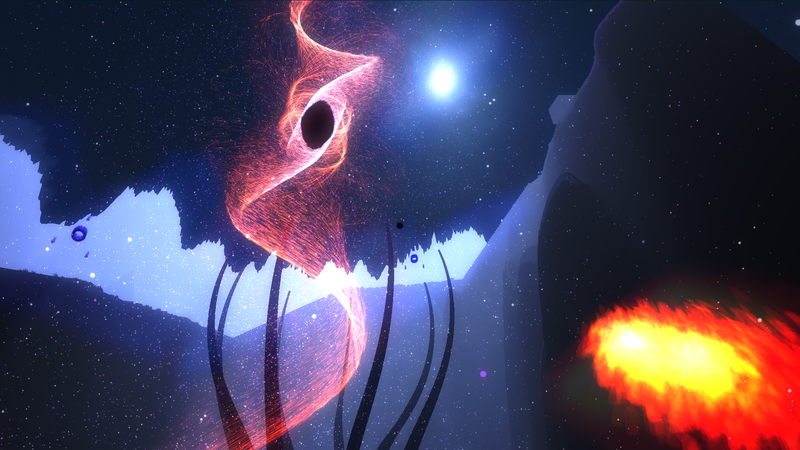 The player must time activation of the singularity when they are in the proper position to block their shots with the particle walls. The astute may recognize this picture as similar to one of the first I posted. It's the same level redone with new/better/less confusing mechanics. I redid the second level from my last post, to this one. What was wrong with it? There was too much walking without doing nothing, and it was possible to miss what was going on. Here's two gifs of the new level which clearly establish the concept of how enemies can destroy the singularity, the consequences of this, and how to prevent it. The only problem is it's hard to read the text when it floats over the particle wall/bridges. I'll figure that out later. Today will be thinking of new puzzles for after you're able to control the singularity. 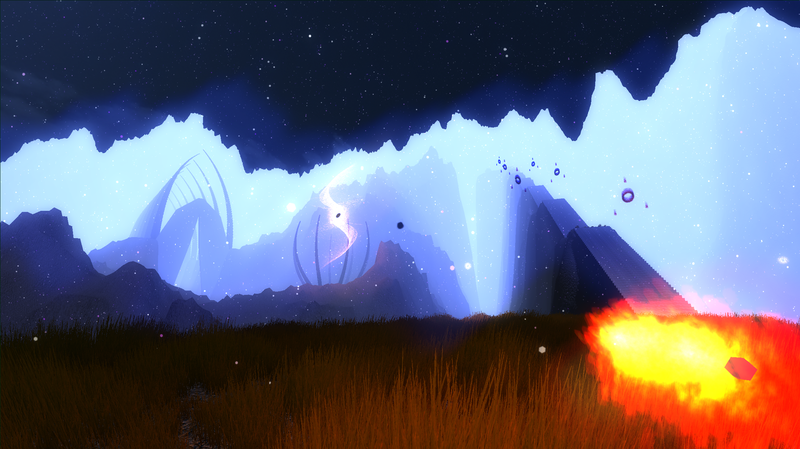 I can't start my new full time job at MIT until Monday, so the past few weeks have been working exclusively on Desolus. After that development may slow down, but I'll find time! I usually work better in bursts anyway.